Children’s Week 2018 runs April 30th through May 7th! This holiday boasts 10 cute battle pets for players to collect, as well as the challenging PvP achievement School of Hard Knocks. If you already have all the pets, be sure to pick up Pet Care Package–the reward for repeating the holiday, even if you can’t get any pets! Pet Care Package is new to 2015 and contains a variety of items including pug costumes like Big Pink Bow, Magical Pet Biscuit, and Flawless Battle-Stone. You will find the guides in the Events tabs. 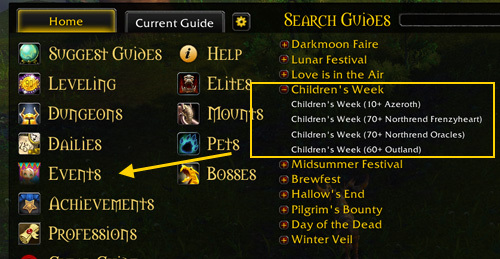 This new update is jam packed with Children’s Week quest guide for Azeroth, Outland and Northrend aswell as an extra achievement guide. The highlight for this event are the…. You can get one pet from each chain per year. If you already have all the pets, you can get Pet Care Package from completing the quests. Check out Children’s Week on wowhead for more info.